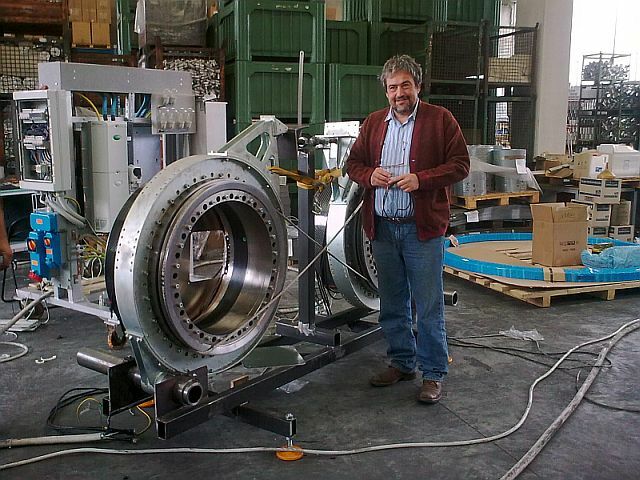 Massimo Ippolito, president of KiteGen Research (KGR) s.r.l., poses in front of parts of the prototype being built near Torino, in Italy. The Kitegen is an ambitious and innovative research project that promises high efficiency in energy production from high altitude winds. 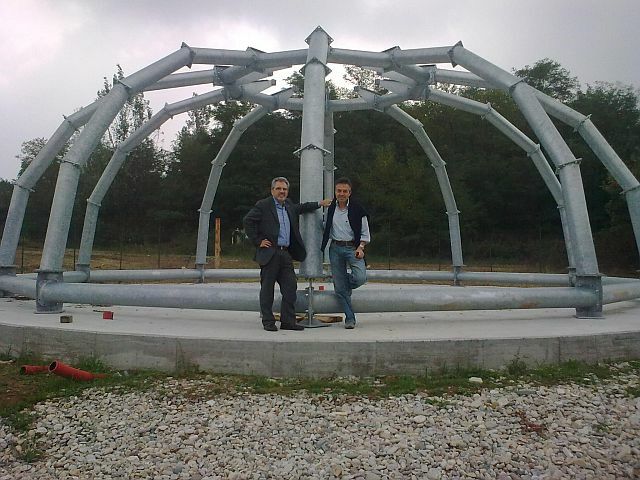 I am just back from a trip to Piedmont, Northern Italy, where I have visited the construction site of the new prototype of the Kitegen; the high altitude wind power (or "Airborne Wind Energy", AWE) system being developed by Kitegen Research s.r.l., headed by Massimo Ippolito. I can bring good news to you: the kitegen project is in motion. After a first, reduced scale prototype, built and tested two years ago, now a full size system is being completed. 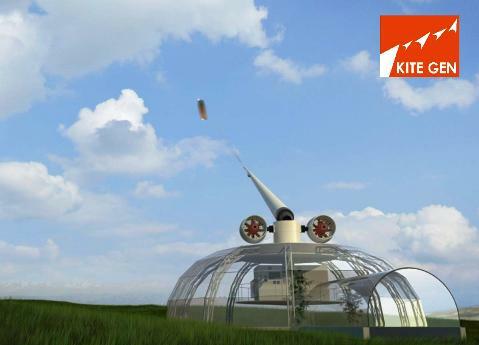 The Kitegen is a very innovative technology based on the idea of capturing the abundant energy of high altitude winds. It uses a kite that is launched from a ground based structure that contains all the machinery and control systems. The kite is expected to fly at altitudes up to 2000 meters and to provide energy by pulling on a set of cables that act on a power generator. The promise of the kitegen is remarkable; preliminary calculations indicate an EROEI better than anything that can be obtained by traditional wind or solar technologies. However, one thing is paper, another is the reality of putting together a machine that had never been built before. It is an incredible challenge that Massimo Ippolito has taken onto himself and that he is succeeding in overcoming; step by step. The challenges facing new technologies are not just technical. The main problems are with bureaucracy and with the general attitude of a society which is becoming more and more hostile to innovation. This attitude has forced Kitegen Research to abandon the initial plans of building the first prototype near the town of Berzano, not far from Torino, in Italy. A small group of local residents has been extremely active in harassing the project; to the point that, eventually, the company had to choose another site. That has generated almost one year of delay; since everything had to be moved to the new site and a new set of permits had to be obtained. However, now everything is ready with the new site: all the parts needed for the prototype have been manufactured and the permits are all available. The construction of the new prototype has already started, as you can see in the picture below that shows the structure of the dome that will house all the ground based parts of the system. In the picture, you can also see the modest me (Ugo Bardi), left in the picture, together with Mr. Mario Marchitti of Kitegen Research. The technology that has been developed for the kitegen is impressive: it is an extremely modern approach which is based on keeping costs low by using simple and inexpensive materials. For the structural parts on the ground, the system uses only aluminium, steel and carbon fiber. Dyneema (high strength polyethylene) is used for the cables that control the kite. The power generator is based on neodymium-boron-iron magnets. The key element of the system is its sophisticated software that controls everything and that makes it possible to use a relatively simple design. This is a typical characteristic of modern robotics and the kitegen is, actually, a robot that controls the system in real time on the basis of an array of sensors; some located on the kite, some on the ground. So, things are moving on with the kitegen. In a couple of months, the system should be completely assembled; then it will be time to start flying tests. Disclaimer: I have invested a modest amount of money in Wind Operations Worldwide (WOW) a company that collects funds from small investors who are interested in financing the development of the kitegen. Thanks for the interesting post. Google is sponsoring something similar in the US: Makani Power is a company with kitesurfers doing some of the development work. Mark my words, anything Google puts their money in cannot and will not fail. I've constantly said it and I'll say it again : high-altitude wind power is THE energy source of the future. It is constant, powerful, and cheap to collect. It will make low-altitude wind power seem expensive. So if it does work well, will we be generating electricity for the grid? or producing something storable and shippable, such as compressed air, and or Hydrogen? I think the problems with various systems to tap into wind and wave are not so big, but what is? Storage issues for energy, and shipment of the energy, and the conversions to needed electricity. I agree with your post. I believe I have the solution to the storage of energy in The Tripe System Report on www.environmentalfisherman.com For over two months I have been asking for a legitimate critique of an 11 page illustrated report on this system. So if it does work well, will we be generating electricity for the grid? or producing something storable and shippable, such as compressed air, and or Hydrogen? Why? Easy : The Grid is already there, and does a perfectly fine job of shipping energy as electrons. jg_ I too have some kite systems drawn up, but they are sea based. The problem with most renewable systems is essentially this: The need for electricity is too far removed from the sites to be at all practical. If there were no such thing as line drop with electricity we would be all set and you would be totally right about how wonderful the electrical grids are. But the reality is that this is the road block to our using most any sustainable source of energy, such as geothermal, wind, wave, solar. The existing grid does not store any thing, but it has always served well for us as we prospered with the fossil fuel systems. We have plenty of good green energy systems that do not interface with the existing grid, as you know from all of the intermittence issues discussed on TOD. Current green systems are being shredded due to this problem. I'm of the mind that what we need is a re-design of our own criteria. So a green grid would present that. A green grid would carry energy in pipes. The pipes carry the energy with little or no line drop, and the energy is on tap. I am certainly not saying we need to destroy the tried and true electrical grid systems. But we could augment our needs with readily available Compressed air, Hydrogen, and oxygen rich compressed air. The pipe systems we do already have are many. We use water pipe, gas pipe, sewage pipe, and all of these would fit in well with the newer energy pipes. In addition broadband can be carried in pipe bundle conduit systems. So more is better for strength and for cash flows. I like the grid we have. It needs improvement. I like electricity but it needs help. The compressed air can help electricity as any steam producer can be turbo charged with compressed air, or for that matter hydro can be augmented with compressed air. Cars are easily run on compressed air but the best of those are gasoline hybrids. So with a pipe system the air is essentially everywhere, and the cars with the gasoline may get many more miles than you may think. The first step in thinking is this: A recognition that our current systems are over time becoming more outmoded, as they don't interface well with what we need. Not sustainable because the production of plastic depends on fossil fuels. Not sustainable because the production of epoxy depends on fossil fuels (crude oil or natural gas to propylene to acetone to bisphenol-A). The conduits are too small to act as significant delivery systems for compressed air, hydrogen, water and natural gas. Pumping sewage through these lines beside fresh water lines is nuts because there will be leaks. Compressed air as a medium to deliver power is basically a failure due to energy loss from compression and expansion of the air. Compressed air cars are a dead end due to low efficiency and short range. Because natural gas is a depleting fossil fuel, any system based on it will be short lived (i.e. natural gas used to heat the expanding air). The pipes will not contain hydrogen. It is dangerous to construct a passenger and freight rail line on pipes carrying flammable and explosive fuels, such as biodiesel, jet fuel and natural gas. This idea from a socialist will swiftly die a political death in the U.S. I suggest you read Alan Drake's proposal, Multiple Birds – One Silver BB: A synergistic set of solutions to multiple issues focused on Electrified Railroads, for another approach for rail transportation and distribution of renewable electricity. Plastic/resin based composites are poorly suited to load bearing since they develop cracks under fatigue conditions, this also creates millions of micro leaks if you are carrying H or CH4. If they are not bearing load because it is fundamentally a maglev system, why are they out exposed and split like that? Use cheaper buffer rails and combine the two pipelines into one more efficiently designed pipeline guarded by the trackbed. And half-pipe ties? Really? Did you actually think through the support criteria here, or did it just look cool? The basic concept has some merit, but the devil is in the details. In this case I suspect that chasing down the details will result in a much different looking system than you've started with. I think we are looking at a two hundred year system, not a temporary fix. The resins used with the fiber will comprise the pipes. I think. What do I know? I have been working alone? Can I give numbers on how much resin one mile of 4' track pipe will use? No. That would be pathetic, but I'm doing well for who I am. Again, if the concept is worthy, then the engineers and the brains need to be put to the tasks. Let me go sailing. You do it. The load bearing constituencies are not important, IF the demands are light. There will be strength aplenty for the tasks. We will not ask a composite tube to do the work of steel with ballast. The proper material and construction to the task. But a four foot pipe has some good strength if designed, or over built enough. The matrix lends here. The light passenger services will not be heavy. The Acella is a monster, from what I read, the Europeans design their fast trains lighter than we do. I'm not a train man. (I want the railroad.net to take me back) (Maybe they can make a train man out of me) I like the half pipe ties.. Again I think the pipes will act more so as out-riggers than load bearers, which is still a darned valuable role to play. If you think 200 year system, then you may like the large cars, the expense amortized, and the luxury, the industry. I went through lots of ideas before settling on the half pipe tie. But so what. I see the half pipe tie as any material you want to make it but I thought that plastic impregnated wood would work. Some load. Not a big load, because the steel rails carry that, and the underlying ballast, or structure. The half pipe tie looks good to me, but a box tie may work better. The devil is in the details, which I enjoy toying with. I KNOW the system will look better if more participate. I look forward to laughing at my attempts. You will have all my design details. Thanks r4ndom, very much. You seem to have misunderstood my objection to the composites. It does not take a lot of load to cause fatigue cracks in resin-based composites. Any repeated load will do, especially extended out over decades, a critical load level is not necessary. In fact thermal expansion over extended periods should provide sufficient stress to destroy resin/hard plastic based composites exposed to weather without any additional stress from trains bumping into them on occasion. Steel would work OK, but as you are doubtless aware from the recent pipeline failures in the US Midwest, even steel isn't immune to weathering effects (and those were dedicated purpose pipelines without additional stresses from even light rail). It's a particularly challenging design problem you've set yourself here, and it may not be solvable at a decent cost per mile. I thought of a few more issues last night. If the 4 foot diameter pipes are above ground or partially buried, water and sewer lines inside will be subject to freezing. Have you given consideration to repairing a damaged section? With the inner conduits encased in epoxy, repairs seem more difficult than with a single pipeline using flange bolts and o-rings. All these details ideas are from me, and so are limited at best. I picked four foot out of a hat. That is not in any way set in stone. Freezing is sure a big issue with the water based liquids. I was thinking that either the temp. would be moderate enough to heat through the main center lines, using warmer CA from waste heat perhaps, or a system of reservoirs could be used to save liquid based products. Or a combination of both. These may want to be first a combination of grey water and urine, and dried #2 with compost, or humus of some sort, with big ratios on the humus side, we would need appliances for this, and then this dried #2 product would be put to use mostly in forestry as a soil builder, and tree growth promoter. The #1 and the #2 separations are tough cultural norms to change, but that is what I'll be pushing. Both "products" are valuable only if seperated. If the grey water, and urine are combined, this is ideal for plant growth, and much, far and away hands down more valuable as plant food than some noxious pathogen rich combination of the two. This is I admit forward thinking, or other. But mechanically it is being done now with success. And the history bears this out. Further more the disadvantages of pollutants into the riverine and pond and estuary systems are now causing lots of problems. Ground water pollution? Big. The current thinking and systems in sewage are not working well because the nitrogen doesn't disappear. The products need to have a use, and need to be totally isolated and used. We can use the "gra-pee" (grey water and urine) as food for plants that are self contained, with no effluents going outside a closed loop. Bamboo, switchgrass, and other plants that are not eaten are the top picks to me. But in Sweden the urine is saved and put on food crops. This has history. The urine is a great fertilizer, close to commercial grade, but free. And the straight urine is best held for a while anyway, eliminating possible pathogens. Ideal for four months in winter of bitter cold. But I worry about the heavy metals, the pharma stuff, and lord knows what else we have our livers and kidneys take out of our blood streams. To be safe the thing is to isolate the use, and then if proven, then make progress, to use the products on food, but I'm betting this may be one cultural norm, even with me, that may be a tough nut to crack. Grass fed stock, with a tea, I would eat. As soon as I can do so I will make available all my drawings of junction boxes for damage control, for blowouts, some sort of catastrophic event. It's not impressive, just conceptual. But I will be out classed and laughed at, because I am by trade a boat builder, a fisherman, a weed puller, truck driver, and a caregiver. The work begins in earnest when and only when the right people are put to the task. I have a friend who is an engineer, and she is disabled, but she's still smart. She is listed on the report. This stuff has to be somewhat over built to my thinking. for some of the fears you and any normal person would think of with such pipes. But we work with lots of hazards now with gas, gasoline, nuclear, right now. I'm thinking the key is modeling. If the concept itself is worthy. I suspected your idea is to pump sewage from the cities back to the farms. Apparently you want to fertilize the forests too. How much does it cost to separate the contaminants from human sewage and pump it along your proposed pipelines back to a distribution depot near the farms compared to an equivalent bag of industrial fertalizer transported by truck? Why is it better to perpetuate a long distance, energy intensive transportation model than to simplify and localize towards villages surrounded by farm land? Thanks. The big advantage of having multiple conduits in systems, local and long distance, is to have options. It is my strong gut feeling that many may be open to the cultural changes that would allow separations of the bio-products: #1 and #2. Over time with conduits available, these future systems have a chance to come on line. No. I would not want to dump sewage on a farm, but also no, I would not want to leech it into the ground water. Here on Cape Cod the water quality issues from our sewage handling, are costing big money and lowering property values and quality of life, and affecting the environment. I have some rough designs of very linear bio-treatment that can be built into a railroad system, that carries energy, track-pipes. This would mean savings in real estate, and waste transportation costs. I like bio-treatment, and decentralization, and closed systems. On Fishfolk we have discussed many times the many water quality issues that stem from waste water, sewage, etc. Even when treatment plants finish their job, often the result is discharges that contain hormones that are not good for fish. Some of the opportunities for the multi-conduit systems would be drinking water, #1, mixed #1 and grey water, #2 with compost, sewage, drainage water. Keep the systems close by so transportation costs are kept down, we think alike there. Having said that the most efficient standard sewage treatment facilities are larger and more centralized. Water and sewer utilities are big money expenditures, so the systems designs are worth experimenting with and modeling. The pro's and con's of every application would be best. I couldn't be set on either centralized, or decentralized, until weighing out the trade offs. But my feeling is that local methane production in digesters for instance are feasible. There are four breakdowns in the sewage expense. 1. collection-(connection costs), 2. transportation, 3. treatment, 4. disposal or use. I am obviously new to these systems, but they may be a big part of a multi conduit system (MCS) ?? Does Multi Conduit System sound a bit more palatable? I had mentioned a good book, "Liquid Gold" by Carol Steinfeld 2007, www.ecowaters.org which states, "Urine can be transported up to 137 miles before the energy used surpasses that of conventional treatment". I can't speak to the validity of that. Salt in urine is an issue. Some grasses actually uptake salt, such as spartina, which is marsh grass. Using the MCS rail lines may have built in digesters. If this were the case the material coming in would be turned into methane, and then the methane would be sent into the MCS, pipes. thanks. The conduit size is to be designed. My stuff gets us started. Between the large car, wide gauge lines, and the mono-rails the numerousness of the systems lines will carry lots of efficient fluid capacity. If there are bottlenecks, then reservoirs can be called on. Flooding mitigation, using both the lines and the reservoirs may work. "Fiberglass" does not have leak issues. We're not talking about an old wooden boat. These composite pipe -- super engineered pipes --will not leak, as a rule. The exceptions are the damage areas. Just like a fiberglass boat. But actually glass, or composite is pretty repairable. Not as good as steel, but can we use steel here? Can we use AL. or cement? Or? What? My systems for the Compressed Air production are offshore. Offshore air to inshore pumped hydro, same basics. With air at depth, the analogy is water at height. The water is lifted up, the air is pushed down, much the same. So are u thinking I have little Briggs and Stratons attached to painters compressors? That would be a headache. These are big offshore systems. We have at the Gulf Stream, the most "roughest" water in the world, when the NE wind blows against the running NE tide. This phenomenon, called wind against water creates steep seas, for a while. We have the current of the Gulf Stream, nice, "free power". We have a shelf with some good wind. Perfect. The machinery for these grounds, which are heaven sent, need to be big. And the CA systems are designed to drag air down to depth, very efficient. Same as pumped hydro, only better. You can not ship pumped hydro. But CA, yes it is able to go into a pipe. Very nice, How much? Compressed air cars, with carbon fiber tank frames, will push us around. Air will be everywhere. Gasoline would be my choice for an extra boost to the CA. Synergies. a complex system. Thanks for the Alan Drake link. We have the fossil fuels. We can use them, Blue Twilight, to their highest and best use here. But we will have few fossil fuels to make epoxy in 200 years when your proposed pipes reach the end of their lifetime. Anthropic climate change is likely to change rainfall patterns and river flows over the next 200 years. A pipeline system whose location is fixed with the main railroad lines can not adapt to those changes. Maybe it is better to build systems that are less durable and costly so they can more easily adapt to an uncertain future. Part of the current problem of converting to renewable energy lies in the durability of the infrastructure constructed for fossil fuels. I hope your system would not result in a similar problem. What do you think the human population on Earth will be 100 and 200 years from now? Should we spend vast amounts of resources and money building a durable infrastructure that might be discarded sometime during this century? High speed rail lines can not be constructed entirely within the current easements for the freight rail lines because high speed trains need a larger radius of curvature at the corners. Rail lines can not be constructed entirely within the median of Interstate highways because trains need a shallower slope than cars. Regrading would be necessary. There problems are surmountable, but they need to be factored into the cost. These composite pipe -- super engineered pipes --will not leak, as a rule. You have great faith in material science. As far as I know, no pipe can contain hydrogen because it will diffuse through any material, including steel, carbon fiber, fiberglass and epoxy. This is one of the big technical problems impeding a hydrogen based economy. Hydrogen will leak into the central pipe with a diameter of 2 feet. Super engineered pipes will not prevent leaks at the couplings and valves. So are u thinking I have little Briggs and Stratons attached to painters compressors? 2. using an offshore wind turbine to create electricity and distribute it through power lines to run an electric vehicle? The units of the answers should be (energy produced by wind turbine) / (distance traveled by similar car). Compressed air cars have a durable, inexpensive fuel tank, a long energy storage time, a simple engine and efficient regenerative braking. On the negative side they have a high fuel cost (energy inefficient), a short range and a need to heat the air as it decompresses. A hybrid air car solves the range problem as effectively as a PHEV, but the other two problems remain. Are you kidding about the natural gas? What about my personal methane, from my digester? Gas is never ending. We can make it. We do make it. But we can not make it in sufficient quantity to power our present civilization. Methane from your "digester" is insufficient to power your automobile, heat your house and cook your food. We are consuming natural gas that Earth has accumulated for millions of years to heat our houses, cook our food, make electricity, make plastics and make fertilizer. When global production of it peaks later this century, humanity will be in deep doo doo, even deeper, I fear, than with peak oil. Then what? Thanks BlueTwilight. While we do have coal and oil, wouldn't it be wise to bring those assets to bear on our conversion to green systems? I think so. I think you may be over stating the amounts of virgin oil based, or coal based material the pipes need. I am hopeful that the inner core can be bamboo and recycle resin. Looking at a four foot diameter track pipe, if the inner diameter is 20 inches to 24 inches then the wall thickness is about twelve or fourteen inches thick. The pressure requirements will dictate that. Taking up space are perhaps twelve inner conduits encapsulated in this thick wall. The inner large pipe could be quarter inch epoxy and glass, and as well the conduits could be three inch diameter by quarter inch. Surrounding the inner pipe and the conduits may best be fiber, I like bamboo, and then three inches of GRP glass reinforced Plastic. Just Steve's starting point. And I'm sorry not to be qualified to crunch numbers as to per mile cost, material quantity, and other factors. I'm over my head, and need help. I'm not ashamed of that fact, I , or we, just need assistance with this. In two hundred years will we have... I don't know. But the old rail system started I think in 1830, so in twenty years our rail system will be 200 years old. The reason for the track pipe is to stave off the impending climate changes if possible. The deeper in we get the harder the turn around. These track pipes will be sort of extruded. The rivers may change and the track pipe can be changed too. It's just a rail system. The crew can rip it out, and I'm sure changes will be commonplace. Change orders are a fact of life. The system is flexible. The track pipes will feed the existing energy infrastructure, they will both work in concert. Plug in 1500 psi compressed air to a gas plant, and you have some fast efficiency. With coal, for base loads the CA works to supercharge as well. Any steam producer can benefit from the turbo. The point is the CA and H will slow down the consumption of the valuable fuels. I don't understand your durability question of the existing really great infrastructure. It's good, so we'll need it to be good for some time as the systems overlap and augment, and in time the efficiencies evolve, in both the old and new systems. The human population in 100 to 200 years from now? Well. I don't know. Should we spend money on a system just to throw it away? I think renewable systems may be the answer for now, and in the future that may change. But for now I'm designing wind, wave, geothermal, and solar systems that generate CA and H.
Costs on both sides need to be looked at. On the table are new systems costs, and also delay costs. The rail lines may take different forms, mono-rail, wide gauge, even gondolas. Grade issues are not a problem, due to the steel rails, plus the track pipes which give grip to propulsion and braking. So that's a big cost saver. The grades are ok, bends are ok. Of course for speed, we'll want to crack a few eggs for that omelet. Hydrogen may be less important than the CA. But I should think we could pipe it and tank it. Leaks? KABOOM. These lines will probably carry oxygen rich compressed air as well, and the two better not be introduced to each other. I do not have comparisons for Compressed air v elec. vehicles. They are both good technologies. I like the gasoline compressed air cars. When the CA expands it cools, and so the CA gasoline engine is very light, not needing all the cooling system weight. I need a better science base. I think the scuba tanks are 2-3000 psi, and the track pipe may use 3-8000 psi. MPa? I'm ignorant of that measurement, very sorry to be so outranked. Please forgive me. Deep sea CA storage in thin walled containers will work, or even deep sea air bladders will work for storage. How many psi is it down to various depths in the sea? Where can I find a scale. I forgot the measurements per foot of depth. Glad to hear that KiteGen is alive and well! Airborne wind power holds great promise and it is easy to get a glimpse of the source of the high EROEI that Ugo has talked about in this post and in previous ones. I sometimes think of AWE and wind turbines as "hydro power for the atmosphere". Just like the sun's energy powers the hydrologic cycle, dumping rain over a river's basin which then powers a turbine as the water flows downhill, the sun's energy acting over vast areas alters the distribution of atmospheric pressure, creating gradient "slopes" along which huge air masses flow "downhill". The larger the areas affected, the steeper this gradient and the faster the air flow. So really a kite at altitude, where air speeds are higher, is a very efficient means for capturing solar energy that has affected vast areas of land and sea. Please contact me if I can help in any way. Bravo. Congratulations to Massimo Ippolito and his collaborators for having (nearly) achieved the impossible. Not only have they conceived a new and (probably) revolutionary way to harness wind energy, but they have also translated this general idea into an actual machine, with all details worked out, up to the last screw. Obviously, the most crucial test is still to come: producing those MWs of electricity from a flying kite. But let's not forget that to arrive at the point where they are today, they had to overcome huge problems. Amongst which the engineering was probably not the worst: Italian bureaucracy, permits, financing, you name it. I'd also like to add that not only the concept of AWE is innovative, but also the kind of project financing with the help of WOW, a company that allows anyone to be part of the effort. With the financial crisis around and banks ever more reluctant to finance projects like kitegen, this aspect of the whole project might be not the least important one. If this continues you will turn into an organazied nation of workaholics who will out compete the Germans in the area of renewables. Dio mio! Magyar, you can't believe how many times we considered that the only way to build the Kitegen was to hijack an abandoned oil rig, raise the Jolly Roger and proclaim it a free republic powered by Kite energy! Italian Pirates Flying Kites.. now I've heard it all, but isn't this blog about energy? Yup, there is a lot of work done in wind energy. The Ampyx idea looks viable to me - it is the same principle of Ippolito's kites. Fly something light and have it pull a cable that moves a generator on the ground. Ampyx's glider seems to fly the same "8" shaped patterns that KGR kites are supposed to fly. Whether kites or gliders are the best way to go, it is difficult to say. Kites are simpler and less expensive, while gliders may be more flexible in terms of control. The sky is large, there is space for everyone. -To use AWE, you must have a good autopilot who can guide the kite through the air for thousands of hours, catching a maximal amount of wind. This is very hard for flex foil kites and easier (still not easy) for a stiff wing kite. It is difficult but still possible on offshore (www.skysail.de), but very difficult on land because of instable winds. That is probably the reason why you only see a animation of Kitegen liftoff, not an actual movie on their website. -The cost of flex foil kite is les than an stiff wing kite, but also the life time. For paragliding foils the time for factory service checkup is 50 hours. Some optimistic estimate life times for a AWE flex foil kite are 0.5 to 2 years, for stiff wing kites they are 15 to 25+ years. -Paraglide flex foils can collapse when it exceeds 50km/h, a stiff wing easily works at 200 km/h. So, a stiff wing is more simple in controlling in the case of hard wind and more cost effective: more speed = more lift = more energy. I just came from the AWE conference at Standford University and three companies where taking the lead; Makani Power, Joby Enery and Ampyx Power. They al have working prototypes. Ampyx though will upscale the easiest, they do not have to care so much about the bigger generators on the wing. Al their components, except for the software, are almost of the shelf. They calculated that their machines will procuse energy at the cost of 25% of conventional wind energy, that is the best in the field and equal to the cost of coal energy (though without CO2 emissions). The work of Massimo is beautiful though, I wish him and his team al the luck in the world. If more people show the value of this new technology, there will be more machines out there to fight carbon fired energy plants. We will see what happens! The Ampyx system without its reliance on many more moving parts seems the most resiliant, although the Joby and Makani devices are impressive. I also like the much lower cost of entry for these systems. I just came from the AWE conference at Standford University and three companies where taking the lead; Makani Power, Joby Enery and Ampyx Power. They al have working prototypes. Ampyx though will upscale the easiest, they do not have to care so much about the bigger generators on the wing. Ampyx Power look to have a single cable, and a 'smarter aerofoil' which will need airborne control and communication. No mention of local power, but perhaps a combination of solar and micro-wind-turbines, could meet the control power budgets ? Makani Power have chosen to fly the turbines, which adds weight and cost, and needs a power-cable, not just a rope. It does however avoid the rewind issues. Their graph shows ~ 2:1 power ripple, so it looks like 2+ of these, carefully phased, would lower that - a lower count than other designs. I think my 'most advanced' vote here goes to Joby Energy. It's good to see this technology finally getting off the ground;I foresee a lot of bugs to be worked out, but the possibilities seem to be dazzling. As I understand it, one of the very biggest problems with wind is that the good wind is so often a long way from the markets in need of the electricity. It seems likely that there are many many places with good wind near cities in need of electricity where a kite gen farm could be built since the kites will fly several thousand feet up. I'm not so sure about Europe. My guess is that if this technology becomes economically attractive most of the poorer densely countries will simply eat the risk and fly the kites over populated areas. It is obvious that such machines will necessarily have to have a minimum spacing distance from machine to machine in order that they not interfere one with another in the event of storms or programming glitches or mechanical failures. How many machines can be deployed per square kilometer or square mile according to current projections? Personally I wouldn't be afraid to live and work on or near a kite gen farm as I realize safety measures will be designed in to get the kites down in a controlled fashion when there are problems. It will take the public a while to become comfortable with this but nobody seems to be bothered about the possibility of a plane falling on thier house any more. Most of the people who will get thier undies in a bunch over a kite gen farm will climb in a car and drive on a highway day after day with scarcely a thought given to the possibility that they will get run over by an eighteen wheeler or hit head on by a drunk. Maybe they will get into some creative business competition... by scaling up traditional kite fighting. Fighter kites are kites used for the sport of kite fighting. Traditionally most are small, unstable single line flat kites where line tension alone is used for control, and an abrasive line is used to cut down other kites. Walt Sandmeyer is currently the international kite fighting champion as decided by the World Kite Fighting Federation Association (WKFFA). Kite fighting is done in many countries, but is particularly associated with Afghanistan, Pakistan, India, Nepal, and Korea. It won't work in the U.S. unless they use 'Extreme' or 'Ultimate' in front of the title. Sorry :0). Hi, OldFarmer. It is curious how the kite scares the hell out of people - even though the kites are made out of fabric and little else. They rather should look up and notice those little shiny things moving in the sky. If one of those shiny things falls down, it is going to do some damage - you know, they are made up of metal and contain a lot of flammable liquids. But, you are right, it has been quite a job to convince people that the kite won't fall on their house (actually that, if it ever will, it will at most break a couple of shingles). Actually, Ippolito failed at that task with the first site they had chosen. He is a great engineer but diplomacy is not his best skill. But, here, it was not possible; not even Count Metternich of the Congress of Vienna would have convinced these people. Sometimes, it becomes a gut reaction; a wave of rage that goes beyond reason and reasoning. As I said, our society is becoming ferociously hostile to innovation. Think if the Wright Brothers had to face this kind of opposition at Kitty Hawk! About your other question, kitegen plants can be spaced of a few hundred meters from each other. So the "power density" of a kite energy farm can be very high. Of course, the kites will have to fly in parallel; they'll be controlled in such a way to be able to do so. What many people tend to miss is the extremely high degree of sophistication that control techniques have reached. The kites are controlled by the same kind of technology that controls - for instance - Predator drones. It is no amateurish stuff - it is not a madman flying a kite. It is top class sophisticated engineering. Actually, it is one of the technological revolutions of our times. Software and sensors together: it is robotics moving ahead by leaps and bounds. It is unbelievable what these things will be able to do - not just kites! North American society is not capable of rational responses to unlikely tragedies. A kitegen unit (or the cable that tethers it) actually crashing is unlikely, and if it does crash, it is also unlikely that it will harm somebody or even do property damage, but it is of course possible for someone to die in a freak kitegen accident. The problem is that North American society takes a worst-case (but unlikely) scenario and comes up with a way of preventing it but ignores the costs of the preventative measures. For example, when I was in elementary (and middle) school, running and any activity involving balls were forbidden during recess, lunch, ect... because someone broke their arm playing tag and someone broke their finger catching a basketball. I'm sure this policy has prevented a few broken bones (and a couple thousand scraped knees and elbows) at the expense of physical activity and the numerous benefits it offers for thousands of children. The security theater involved in flying is another example that needs only a little bit of discussion: It would be perfectly easy for a terrorist to pack their bags full of explosives and detonate them in a line at a security checkpoint and kill and maim 100 people, which is maybe not as much as a full planeload, but still there is nothing actually preventing it from happening. Have you considered applying for the sort of "limited maximum liability" government insurance offered in N. America to nuclear reactors? Should make the fearful more calm if they know you have full damage and liability insurance coverage for any possible harm to them, eg. your paid insurance comany up to a limit, the government beyond that. Fission plant failures have demonstrated the ability to take 20 or so square kilometers into a no-go place for humans and even make wildlife inedible. I do not see how a kite failure can make wide swaths of land no longer able to be used by man. I did not say it could, simply that the NIMBY bunch might be less resistant to installations if (very) reliable insurance is guaranteed available for any problems. Fission plants need the Government backing because of their horrific failure modes that render land and food unuseable. While a kite falling out of the sky is going to effect things on the ground - it won't need coverage beyond what insurance firms already cover - things getting smacked from the sky like hail. But there are so many airborne perils! That's a good question, and the Joby Energy example above, where they fly the Generators, would have a smaller land footprint than a Cyclic-Retrieve design. That said, they are likely to be noisier than a passive airframe, and it may be hard to gauge public reaction to what looks more substantial, but also seems to have more control. Leasing airspace over (non livestock?) farms, is likely to be the workable answer. A little cash flow, buys a lot of goodwill. but now there is nothing. Do you have some information about the EROEI for different configurations ? We have some idea of the EROEI of the plant from from some calculations done by Massimo Ippolito - these have not been published. When we have an actual machine running, we plan to make a more detailed LCA calculation. About the site you mention, I don't know. I know that Mr. Milanese was collaborating with Kitegen research up to a couple of years ago, but not any more. You can find the result of the evaluation of the Kitegen performed by Mr. Ragusa, a student in Mr. Milanese's group, at this link http://files.meetup.com/312598/vento_ragusa.pdf. Alas, it is in Italian! "In a couple of months, the system should be completely assembled; then it will be time to start flying tests." It would have been better to wait until there were some actual flying test results before posting in TOD--there are zillions of things which sound good in theory, but don't actually work out in practice. One thing, this sounds like it would be a threat to aviation if a plane flew into it--thus the aviation authorities might require a very extensive set of warning lights, etc--which could well make it cost prohibitive. chances - a full sized demo unit doesn't mean it'll work in production. Or even be 'economical'. With all them thar new fangled man made materials from oil in the unit(s) - plenty of ways to not have 'em work out. Polyester for pantsuits not power kites I always say. And why are you worried about planes - this thing is an obvious hazard for the flying cars which should be here anytime. There's nothing wrong with posting about a work in progress, as long as it's not pretending it's something it isn't. Your concerns and anyone's are worth hearing about, and that would be a very good reason TO be airing this project idea early on, so the creators can hear about cautions they might not have considered..
but just as well, don't assume they are fools, either. With the amount of development shown in the keypost, don't you think the author and builder might have given some thought to these things? Why was I expecting this ? Seriously though I'd be interested in the relative cost and maintenance of these versus turbines. What happens if they break loose and land on cars/cows etc ? Yeah, Mr. Ippolito needs to protect names like KitteeGen, or he could be in trouble. The Kite part, as I understand it, it just fabric.. all the generating and electrical gear, save for some sensors and perhaps small radio transmitter, are otherwise on the ground. Good point, Jokuhl! We have to worry about that, too! The base looks like it will last a very long time, maybe 50+ years, the neodymium magnets can be reused, and the aluminum can be recovered at only 5% of the energy used to extract it. Thus, KiteGen should have a fairly high residual value (in both energy and nominal terms) at the end of its life. Yes, GreenPlease. Massimo has been putting a lot of thought in making the machine in such a way that it will be "sustainable" in the sense that most of it can be recycled. Of course, at this stage, the main point is to prove that it works - but we move from a good start. What happens when the kite is hit by lightning? Can the string handle the charge or does it fuse? Can the energy from the lightning be captured? Great news that new things are being tried, good luck to them. Newtbert, many of these questions have been debated in the comments to the links that I have provided at the end of the post. Anyway, kites won't be flown into thunderstorms: among the various controls available, there are radars on the ground that keep track of the atmospheric conditions. In any case, the string is not conductive. If it is wet, some current would pass through the water film - but very little; rainwater is a poor conductor. In the very worst case, it might burn some component of the electronics on the ground. As for your other question, we made some calculations but the energy from lightning is not a reliable source and not very abundant either. Actually in Berzano site (for the moment abandoned) no concrete was used to install and block the structure to the grond, even though the top of the hill was not so flat - on the contrary, as you can see in these photo. While it will be interesting to see the results of this experiment, I doubt that the results will be the sort of large power output claimed by the promoters. For example, their graphic comparison between a horizontal axis machine and the kitegen and the description presented is incorrect. For a horizontal axis machine, the air flow thru the disc defined by the rotor diameter is fully utilized to power the turbine. It's not just the tips which produce the power. The blades have a twist, which when operated at the optimum speed, gives the proper angle of attack to the relative wind at each station along the blade to produce torque on the hub. With the Kitegen, only the area of the kite can produce a force and the swept area has little to do with the total power produced. Then too, the Betz Limit applies and the maximum power output can not reach 100% of that available in a cross sectional area of each kite exposed to the free stream wind. I think that anyone with a novel idea should have the opportunity to test the concept. However, it's often simpler and less expensive to test an idea with a good model instead of building a full scale working system. Do you (or Kitegen) have a reference to some sort of numerical model of the device? I doubt that the results will be the sort of large power output claimed by the promoters. In the years after Edward Bernays and his books Propaganda and it re-titles as Public Relations, how often have the claims of promoters understated the benefits of their products? The under-priced nature of oil (aka, look what we've found just under the ground, lets price it at the cost of production) has made the capture of energy from environmental flows seem 'expensive' or 'low yielding'. While it will be interesting to see the results of this experiment, I doubt that the results will be the sort of large power output claimed by the promoters. For example, their graphic comparison between a horizontal axis machine and the kitegen and the description presented is incorrect. The power available is not that of the area covered in the kite's motion, it's closer to the area of the kite itself, the "A" term in you airfoil calculation. What one must do is calculate the forces on the kite, thence the forces on the rope as the kite progresses thru it's motion. Then, calculate the power as the kite is allowed to move away from the fixed base, while remembering that the force is a function of the relative wind, not free stream wind. Don't forget that the kite won't produce power while the rope is reeled in and power will be required to bring the kite back to the starting position. How do you think that some special sailing boats can move through water faster than the wind? The fact is that this kite is taking energy from a far larger area than its cross-sectional area would imply. If you like, it is slowing down the wind over the huge area it is traversing. There is no magic there. The fact is that this kite is taking energy from a far larger area than its cross-sectional area would imply. My (naive) guess is that the effective cross sectional area is multiplied by the kites horizontal velocity divided by the free stream velocity. I'm guessing that factor is 3 to 8, certainly not a hundred. Perhaps Ugo can come in with the correct fcator. Comparing Kitegen aerodynamics with a horizontal axis wind turbine is the wrong model. Use your loaf or ask any civil engineer, aeronautical engineer or hydraulics engineer. This is tedious. Have you checked my link, I guess not. the air flow thru the disc defined by the rotor diameter is fully utilized to power the turbine. The tips gather most of the wind power, nobody of KiteGen said that just the tips produce the power. Perhaps this picture could help to understand. The theory behind KiteGen is certainly correct. the kite behave as a wing not as a parchute. The KiteGen is a lift machine, not a drag machine. It may be counter-intuitive but that, hopefully, is not our fault. I hope this could be a suggestion to approach more accurately this topic. Hah! No, it most certainly isn't! Even Einstein had trouble with the physics of sailing, though I do think that Mr. Da Vinci could probably understand your kite and he would be proud of your genius, sir. Bravo! ...Even the brightest of us have shortcomings. Even geniuses of the centuries. I wish every elementary school in the world taught sailing! I'm sure if they did the world would be a much better place. The lifting force is determined by the Bernoulli effect where the inputs are the surface area of the lifting surface and the speed of the airflow over it. The mass of the airfoil has absolutely nothing to do with the amount of lift generated in this way. The Bernoulli effect is thought to be the explanation of the lift force on a wing at low angle of attack. However, there is also an effect due to the change in direction in the airflow as it passes around the wing, which is more like the vanes in an enclosed turbine. However the lift force is produced, that force on an aircraft must balance the gravitational force, else the aircraft either ascends or descends. The gravitational force is where the mass comes in and any device will have a mass. It's just that the mass of a kite is going to be rather small when compared to a solid structure of the same wing area, thus, the lift force will of necessity be small as well in the steady state flow situation I described. One must be careful in defining the axes, which is the reason I specified an Earth referenced one, i.e., lift is defined in the vertical direction, not in some fixed axes system attached to the structure. However the lift force is produced, that force on an aircraft must balance the gravitational force, else the aircraft either ascends or descends. Or in trying to ascend pull on the string that is how this system generates - the mass of the kite should be as low as practicable to maximise the useful energy output since the potential energy the kite gains isn't recovered. You are making a silly error (missing the action of the tether from your vector diagram) and being highly insulting in insisting you are right. This is not a drag machine. You seem sure of your theory but I think you have missed a point somewhere, so I'll attempt to explain. Apologies if this is elementary. This is not a drag system like classic childrens' kites or a paddle - the kite is an aerofoil. Its mass and gravity are irrelevant here, but for analogy the kite is tethered so the wind thinks it has infinite mass and the 'gravity' is in the direction of the lines to the generator. The kite benefits by being light so it accelerates more quickly. The front of the aerofoil in some examples is open to allow the wind to inflate compartments to give the wing its aerofoil shape - ie. the top surface is larger than the bottom so as the kite moves forward across the wind, the air on the far side travels further which causes the distance between the air molecules to increase therefore exerting less pressure on the far side, so therefore the near side 'lifts' away from the winch/generator. The kite and lines operate in a conical volume. The kite wing flies continuously in this cone in a horizontal figure 8 pattern transverse to the wind, reaching speeds of over 100mph when perpendicular to the wind and exerts a lifting force more than proportional to the wind velocity and transverse velocity. Maximum lift is reached when the kite is flying fastest through the axis (0°) of the cone, and the line is allowed to pay out to drive a generator. The lift is greatly reduced when at the extremities of the cone's operational range, and the line is reeled in. Therefore the kite's altitude and range vary roughly sinusoidally 2:1, with the average altitude and distance remaining constant. The high working force comes from its high transverse velocity creating the vacuum on the far side of the kite owing to its aerofoil shape, and is an *order of magnitude* higher than its cross-sectional drag. Having flown these kites for many years, I can vouch for this force with a 3x0.5m flexifoil kite being able to pull over 100kg in a strong wind. A 10sqm kite should be able pull a landrover out of a ditch. I agree that the kite would act like an airfoil. Not a great airfoil, I might add, since the surface is not solid and the air flow across it's upper surface would tend to be turbulent. Airfoils used for wings (or wind turbine blades) produce a lift force when there is a small angle of attack to the relative wind. As the angle of attack increases, separation occurs and lift is reduced. For an aircraft, that condition is called stall and the aircraft will fall out of the sky if the angle of attack which produces stall is not reduced. There have been instances of aircraft crashing for exactly that reason. I took flying lessons for a while and learning about stall was an important detail of the a pilot to understand. I agree that there are maneuvers which would cause the force on the rope to increase. The simplest would be a climb and dive cycle, also known as "porpoiseing". Starting with a fixed rope and the device at a steady altitude with low angle of attack, the pitch controller would be used to increase the angle of attack, thus increasing the lift and causing the device to gain altitude. At some maximum altitude, the angle of attack would be reduced below that which would keep the device steady and it would drop due to gravity. While climbing, the force on the rope would be greater than steady state, while in descending mode, the force on the rope would be reduced, possible to as low as zero as the device dives toward the ground. Extending this analogy to 3 dimensions by using yaw control, the kite might be forced to follow a circular path or the more complicated "figure-8" planned for the Kitegen system. The problem is, even though these flight plans produce strong forces with a fixed rope, they do not produce power. To recover power, the rope must be unwound from the reel while driving a generator. By doing this, the force on the tow rope is reduced because the relative wind is reduced. There is a limit to all this as there won't be any force on the device if the rope is allowed to play out at wind speed. At some rope speed below the wind speed, the power generated will be a maximum. My mental picture of this process is that the angle of attack of the airfoil will need to increase to provide the maximum force as the rope speed is increased. There is a hard limit to this, in that as the rope speed is increased, the airfoil will eventually stall and the lift component will fall off rapidly. A kite, if it is of the type device used in a paraglider, would act more like a parachute at high angle of attack. When used in a Kitegen system, if the operation is like that of a paraglider, one might expect problems during the downward portion of the cycle, when the relative wind becomes even less than the average. Furthermore, a paraglider type device has little ability to control pitch, since the shrouds are attached at a point well below the sail, thus the pitch angle is built into the sail, MOL. Yaw control would very important, perhaps critical, as changing yaw angle would drive the side to side motion. Given these thoughts, I suggest that the Kitegen system won't produce nearly as great a power output as claimed. They show the power cycle, with ripple, and positive and negative phases. The details of the power areas, is somewhat less important, as a 'bigger kite' is quite easy to add. Seems like one obvious limiting factor would be the area required for each one. Since the kite flys so high above, the risk of kites colliding and getting tangled means much more space is needed between them than conventional wind turbines. It's not like you'll see a whole hillside with these devices in close proximity to one another. But other than that it sounds like quite an interesting project. I particularly like what the cable is made of, 'high strength polyethylene' - gotta love it provided it has a long life. As discussed in response to an earlier post (http://europe.theoildrum.com/node/5538#comment-517230), the cable is likely to have a very short life. To generate energy, it must be rapidly reeled in and reeled out, with drastically varying tensions. Dyneema is good stuff, but it doesn't have an infinite fatigue life. And incidentally it's rather expensive. Even at high altitudes the wind speed is not constant, so Kitegen doesn't solve windpower's biggest problem - i.e. irregularity. So I doubt Kitegen will be a success - but I hope my doubts prove wrong. A full-scale power plant in operation would be a magnificent technological spectacle, with those gigantic kites swooping and soaring on their 2000m tethers. Invariable coal plants have proved to be a success despite the power usage that varies more then 50% over the course of a day. Why would a bit of production variability be a problem for Kitegen's success? It is always the point I try to make. These are NOT just kites. The kitegen is a full fledged robotic system that controls a number of kites together. It is like planes flying in formation. If planes were controlled by someone on the ground just looking up at them, flying in formation would not be possible - of course. In the case of the Kitegen, there is no pilot; the software controls the kites on the basis of the input it receives from an array of sensors and moves the kites by calculating their position in real time. So, if the Kitegen works as expected, the likely thing you'll see is exactly what you say: many kites flying from the same hill. About the dyneema cables - the software is made in such a way to minimize the stress by keeping the cable at constant strain. This is what I mean when I say that the system is VERY advanced; it is the modern way of making mechanical systems. It is expected that the cables should be replaced every six months of operation. It is a very small mass that can be in large part recycled. Incidentally, the cables are one of the very few parts that come from petroleum. Fascinating concept. I truly hope that it succeeds. I do have one question, however. Has any thought been given to having the base stations transportable such as truck or trailer mounted? Portable power stations would be very valuable after natural disasters when liquid fuels for deisel generators are not available. Of course, I might also mention that the military might have some interest in developing this technology. "by keeping the cable at constant strain"
This puzzles me. Each kite in the system seems to fly in a cyclic repeating path. Mechanical force is tension along the line of the cable. The mechanical motion of the cable at the base station can be in the direction of the cable or transverse to the cable. But the transverse motion does not transmit any energy(work) from the kite to the base station. The only way that I can see energy being gathered is to have a cyclic repeating change in the tension in the cable. Surely this involves cyclic change in both the stress and strain on the cable. I can imagine that careful design could limit the stress variation to well below the elastic limit of the material, but NO change? Really NO change? How can this be? And what is this thing they call the return phase? How does it differ from the power phase? Actually, I think kitegen can work. My puzzlement is that the promoters think their explanation of how it works is sufficient. The entire cycle has two periods, one when the Kite is unspooling its cable and generating power, and the second when it's being reeled back in to it's 'bottom altitude' to begin again. ..as they posted initially in Summer 2009..
"The kite moves like a yo-yo: when it goes up, it generates energy that is transformed into electric power by the generator. When it reaches its maximum height, it is placed in an aerodynamically non-lifting configuration, so that it can be pulled down at a very small energy cost. Two coupled stems would work like a two-cylinder engine, although the "power" phase would last 90% of the time while the "pull back" phase would be much faster." My complements, Ugo. Please let me know if I have this correct: As the kite rises, it pulls the teather which turns the generator. At altitude, the kite is "tipped" so it falls; as it falls, the teather reels in; and it is then allowed to climb, thus generating more electricity; and the cycle is repeated over and over, perhaps for weeks at a time. I am looking forward to seeing the prototype work. A very likeable idea. Is it possible to make a low-tech version, without the computers? Could such kites be steered by humans, or by mechanical machines? How much difference would it make if the cable wasn't an exotic polyethysomething? I pose the question, because if this kite generation could be made to work with 16th century materials and skills, there is hope yet. If it does absolutely depend on oil-based fabrics and robotics, it will only work as long as both are available. The question again of how far back do things fall? What can you do just starting with a set of modern chemistry and physics textbooks (of which, of course, many millions have been printed and distributed) Do you still have Electromagnets? Can you create Semiconductors and decent capacitors? Knowing what electric power and radio transmissions can accomplish, would we really (from all corners of the earth) let those tools perish? There are a range of polymers which are sourced from natural gas, others from even more common organic sources, like rubber, casein in milk, cellophane etc.. there are ceramics, and of course a great supply of scrap metals to be played with. What does it take to produce a good High-carbon steel or a Stainless? Can we use electric arcs to keep working with Titanium? - One of the key tricks to this kite, beyond the tether is how to control the 'phase-change' of the flight, from rising to falling, back to rising. Would you simply run multiple lines up there and work out a no-tangle scenario, or use some simple electronics and fly the kite with Radio Control to adjust the control surfaces? There are also some great old kite-runner toys, which run up the line with the wind, hit a switch and maybe then drop off, or change modes themselves and slide back down. These could be very basic triggers for such a mode change, sending the kite between 'lift and descend' modes. Controlling a small kite by a person is easy; but a large one requires some kind of mechanical system which has to be carefully controlled; and that goes beyond the capabilities of springs and gears. Besides, when the kite is high in the sky, you barely see it by the naked eye, and how to control it? DSM, a multi-billion dollar conglomerate that specializes in material sciences, wants to promote its Dyneema fabric as a material for fashioning tethers for airborne wind turbines. Dyneema is 15 times stronger than steel, resists corrosion, and does not wear out over time. "This material will never show fatigue," said Hans Plug, a company manager. I find the idea worthy of merit and wish I'd thought it up. Hello from California, where wind turbines have been generating power for the grid since 1981, and interest in wind-generated electricity has always been intense and active on many levels. While KiteGen is an attractive and novel notion, I see the barriers to overcome are typical of any operation to harvest diffuse, non-fueled power. First, the quality of the electricity harvested (voltage, amperage) will vary, and will need considerable "conditioning", so it is imperative to give an annual KwHrs harvested, delivered in a grid-acceptable "condition", in order to understand the COE (cost of electricity) number, which is the first number that government agencies look at. As was pointed out in the "Dutch" study of small wind devices, power output is typically exaggerated. Second, the conversion directly of wind energy to electricity leads to problems of energy storage and electricity quality. All energy capture (in my opinion) from intermittent sources should be converted to water under pressure, where conventional hydrodynamic machinery can efficiently (and, more cheaply) create the right voltage, load, and instantaneous dispatch. Third, any "rare earth" factor in a system creates a cost factor that increases, rather than decreases, with scale. Fourth, all land-based systems (wind, solar) will invariably run into hostile populations, as the current installed wind turbines demonstrate. The future of non-fueled electricity generation lies offshore, over the horizon, where the operating scale becomes large enough and economical enough to meet COE requirements. Over-the-horizon offshore installations (OTHOI) are the future of this type of energy production, so the sooner the ancillary tools are created (autonomous, at-sea robots, offshore storage of power, transmission to shore of seawater under pressure, onshore conversion of power ("reverse river") the more readily schemes such as Kitegen are adopted. I said "barriers to overcome" rather specifically, in contrast to some sort of "it won't work". Jumping to a conclusion not stated doesn't advance the discussion at all. We use a lot of energy already for stupid things. So it's more energy for (more) stupid things? How about just cut out all the stupid things. Seems if we did that, we'd have more than enough energy already. Ahhh but your 'stupid things' may be someone elses must have need. For example - I consider a flat screen 3D television to watch Avatar a 'stupid thing'. I'm betting others do not. I'm referring to sustainability. And then there's the concept of need-creation in marketing. Are you/we/earth better off with/without? Stuff like that. Stuff that matters. The irregularities we see in Rigid, Tower Based WT's will be quite different with a computer flown kite, so the concern about 'conditioning' the power will already be started at the flying stage. The wind source at these altitudes will have a much different frequency of change than ground winds as well, far stronger and more constant I've always heard, though I don't know much about how extreme these are. Once you have multiple kites in the air with a common control system, it should become even easier to manage the common output of the group for continuity. The kitegen comes with a storage system based on supercapacitors for "smoothing" the output. The supercapacitors can also work as emergency backup system in case of power failure; in other words, the kite can always be pulled back, even when there is no grid power. In terms of intermittency, the kitegen should give a more constant output than conventional wind towers; the intermittency problem should be much eased, although it would not completely disappear. Finally, the calculations give a cost per kWh which should worry all competitors. But, right now, the objective is proving that the kitegen can work. Later on, we'll see how cheap the kWh can be. Sounds like yet another Energy-Regime Scheme(tm). The kitegen comes with a storage system based on supercapacitors for "smoothing" the output. Supercaps sounds expensive, and something of an overkill. Did they consider spinning (flywheel) storage ? How many kites do they plan to co-ordinate ? Do they plan to change kites to match forecast wind speeds ? It seems from the power profiles, that precision co-ordination, and more care on the rewind, of 10-20 kites, could make the smoothing power average much lower (and thus cheaper), tho you'd still need significant site capacity for 'kite down' situations, and during ramp-ups. About the number of plants, right now it is difficult to think of a limit. I think a dozen kites would work fine; but it is a future stage. Do you know how many kites they intend to test with ? At the beginning, just one! Shouldn't need to change them. Remember the 'up down' motion - to get the down effect the kites profile is changeable thus in high wind you'd place the kite in the lower profile and hang on. Using KitGen to pump water might be an alternative use, particularly for desalination plants. This would be similar to waht Carnegie Wave Enegy invisage for their <CETO technology. Big difference of course is the need for sophisticated flight control. Using KitGen to pump water might be an alternative use, particularly for desalination plants. This would be similar to what Carnegie Wave Enegy invisage for their CETO technology. Big difference of course is the need for sophisticated flight control. as the peaks are easier to manage in a pressure system. Targeting both markets would be good. I always thought we had enough energy. Why do we need more? How much will be enough? Did you notice the theme of Peak Oil that pops up around here? Even if what we have today were considered 'just right', this proposal would be to install generation that would SUPPLANT existing production, such as Coal and other polluting sources, hopefully by undercutting them financially, but in any case to have backups available when the traditional and dirty forms of generation start falling off the map due to resource inavailability or cost of extraction. I do appreciate your concern about the big business model of Large Scale Utility power.. but if I'm going to tilt at something, it won't be windmills just yet. There are plenty of behemoths out there that are doing too much more harm to us. Ultimately, the tools for having your own sources of power are available, and a modest amount is affordable with a reasonable degree of sacrifice and investment. That would be my preferred model to create a more perfect democracy.. if we all really wielded our own power. Yes TOD does have too much peak oil on the brain. Problems and their causes are the home of the light weights. It is in the solutions to the problems where the heavy weights live. The Kite is cool. I have lots of them on my list of projects. Bollard pull is good, a much better bet than the whirligigs. The solution to energy issues are to be found in the storage and shipment, conversions and re-conversions, in fact non-electrical as a shipment mode. www.environmentalfisherman.com Nothing beats the Tripe for energy storage and shipment. The kite is cool. There are plenty of ways to tap into wind, and wave. But the power must be saved and transported. Right? Wouldn't that be a better place to be looking? TOD Clowns, Kites, what's next? How about sled dogs pulling trailers of water up a spiral water tower, assisting a wind mill, and with a tourist attraction, such as a built in alligator farm to eat the dogs. Are you capable of posting a comment that is not a thinly disguised advertisement? I, for one, are fed up of your tripe. Good for you ROV: I have put lots of time into this system. You have not read the Tripe System Report. Many people have points of view that they push. I don't sell, and do not advertise, I discuss ideas. The Tripe system is an out of the box idea. If you think you are so smart, then why don't you look at the report, do a critique, and if you feel it is utter rubbish, then state why. I am sick of the non-sense too. I say do a critique. You have time for a kite, and no time for a comprehensive system of energy shipment, transportation, utilities? I'm saying this system handles all forms of sustainable energy, in that it gives them a common denominator, which is CAES, and Hydrogen. As far as I know not one person on the oil drum has read the report. It is 11 pages illustrated, accounting for a good portion of my life, so try reading it and it may change your attitude about advertisement. It is a systems idea. It is very different. The system uses pipes which are also used for a railroad system. I do think it will work. You might want to consider a change of name. Or, is this satire going over my head? ThisOne: I Don't mind. Call it what you will. Kids don't have an issue with the name, because tripe is not in their vocabulary. Tripe=Track+Pipe. I thought that was a good description of the system, which is both a railroad track and an energy/utility pipe. The report is illustrated and you can see that steel rails are used for most of the train's weight. But the pipes offer lots of options for wider stock, monorails, new designs of fast things in general, as the pipes will be fair as hell. Thanks. Yeah, but anyone with a decent vocabulary will have to stop laughing at you before they can try to take a serious look at your project. "Tripe" is an English word for animal intestines, and smells disgusting. Some people actually eat it, or use as dogfood. It also means rubbish - "What a load of tripe". Worse than being laughed at - using this name for a product just shows they don't care nor are competent enough to type a word into google to check first. I think the Tripe System Report is some of the best work I've ever done. Words often evolve into other meanings, so let's not be too shallow. Young folks don't have your hangups, and they will be the ones building this system if it passes muster. Behind the 11 page report I have about 1500 detail drawings or writings about the economics of such a system that would take rail easements and power plants as it moved in. Who else is pushing any comprehensive system to bring renewables and existing systems into line? It's a machine. How hard would it be for you to look at the damn thing? It is illustrated. It's a new complex system proposal. www.environmentalfisherman.com has the Market Quota System, that's fisheries stuff. While I was designing offshore wind systems I came to believe offshore systems would need another form of energy shipment. So I thought the compressed air technologies would work, and they will, and so will Hydrogen, because the machinery will be big, offshore. Aren't we running out of oil? Quibbling about the word "tripe" : isn't this a bit much? I designed the system: And I named it. So What. A Rose by any other name smells as sweet, right? Green eggs and ham, green eggs and ham, I don't like them. ..... Try them ..... I must have read that one 50,000 times. Be well. It was enough to keep me from looking at it. I need to filter what I spend time on, and if someone can't be bothered to check a dictionary for their cool acronym I consider it good odds that they missed other details like system loading, metal fatigue, and accurate cost calculations. Now I realize it wasn't aimed at me, but there a lot of folks out there with money you want to make this happen that will apply the same filter and refuse to give you the time of day. Personally I'm amazed how tolerant TOD has been of SJS's posts, I'd have banned him for spam by now. SJS if you want people to look at your stuff get it accepted as a guest post, just randomly telling people it will solve all their energy problems while making the tea and cleaning the bog just guarantees you get ignored. I think the Tripe System Report is some of the best work I've ever done. Words often evolve into other meanings, so let's not be too shallow. Young folks don't have your hangups, and they will be the ones building this system if it passes muster. I worked in advertising and marketing for the toy and music industry in New York, trust me when I tell you that a name like 'Tripe' will not fly even if it is the most brilliant concept ever! The legendary Chinese Restaurant in Carrol Gardens Brooklyn, I recall, was a Transliteration of the Words for the Great Wall of China, but it seems that 'LUNG FAT' actually held on alright, might even still be there! Not that I'm trying to encourage Steven with that. If it's stomach-lining you want, call it 'The Gut' .. or maybe 'Transverse Canal' Even when you know what part of the body it is, it's got a bit of toughness to it. BING, BONG! "Peristalsis, Peristalsis. Please stand clear of the closing sphincter! Flushing Meadows is next.."
If it is the best work you've ever done, then please give it a name that reflects its worth. Tripe has been in use for hundreds of years and means one thing to all generations apart from uneducated individuals who have only known Bic Macs. Animal intestines. I understand your point about a rose etc, but this is not shallowness, some words just cannot be reinvented. The use and association of tripe is just too negative and too strong. If you have ever fed it to your dog, or eaten it or seen it at a butchers, then you will know EXACTLY what I mean. If there are any traditional butcher shops left in America, go to one and ask! Personally, I do not enjoy the image of smelly guts every time I see the word! For your life's work's sake, accept your peers' point of view and change the name. OK TOD FOLKS: I did say "Call it what you will". I can't help it. My mother denied me tripe at the supermarket when I was a small boy, and apparently I'm still affected by that snub. So as far as the whole system, any of my systems: If you can do better than me on any of various points, Then I thank you sirs and madams. That's how systems evolve, and that's how I learn, and grow. This system is my gift to the whirled. It is ours. It is ours to have in common, and if "tripe" makes your lunch impossible, then for God's sake let the oil drum gang take it upon the table and clean it up. Change the name of the system. www.environmentalfisherman.com The ------------ (to be announced) System Report. Nothing beats the Tripe for energy storage and shipment. Plenty of systems do. Demonstrated by their use and your shilling for TRIPE. But do consider writing up some TRIPE for a front page post instead of shilling inside a shilling front page post for a different product. Ulf Bossel: There is no future to a hydrogen economy because it is much too wasteful. We cannot solve the energy problem by energy waste. The energy losses are all caused by laws of physics. If you go through the entire hydrogen chain starting with AC-DC conversion, electrolysis, compression, or liquefaction, transportation, storage, re-conversion the electricity by fuel cells with subsequent DC-AC, there are additional losses in every process stage. These are all related to physical processes. This is physics, not poor handling, and as the laws of physics are eternal, there was no past, there is no present, and there will be no future for a hydrogen economy. Hydrogen economy is a structure of mind, which has no backing by physics. The system can work with Compressed air only. But I would humbly submit that even though I'm no Hydrogen expert, the technologies are being heavily researched, and most feel show much promise. My offshore systems are massive compared to the small wind toys inshore, and land based. Higher is better. Bigger is better. More wind, more compressed air and or Hydrogen, and oxygen rich compressed air. Thanks for the links. I need to know more about hydrogen. I'm wondering. Have a few of you read the report? Just to embarrassed to admit it? Or read it and didn't understand? The Tripe System does not stand alone on Hydrogen. The pictures show many conduit uses. Natural gas is a biggie. Thanks. I took a look, but I'll admit a very short one. Partly due to a busy schedule, I have to say, but also, right out of the gate I don't like the blend much of this storage/transport for gases as the same structure that carries transit equipment. I think it's a troublesome hybrid, and the failure modes seem pretty serious. (as well as the maintenance implications and the apparent, initial costs.) But as I said, I didn't read the details.. this was a first impression. But I would really expect a lot of tangles to reveal themselves in such a system, when either was offline and needed work that complicated the other one. How tough is the pipe (and/or, How thick a pipe is affordable for thousands of miles?) to withstand a train wreck, and what happens at that crash site? How do the trains work around a leak or breach.. and do these complications make a real argument for keeping these systems physically independent enough to not trip both flows when one has a problem? In comparison, I personally like the triple hybrid of Electric Railways Travelling on common Rights of Way with Grid Power, and then their service roads also built with dedicated Bike/Hike Routes along them. The Rail equip can provide servicing tools to the grid.. a paralleled grid can power the repair work for any of the above.. etc. A further addition could be to string a long and narrow solar collection scheme along this sort of route, so that the power is already adjacent to it's destination(s), and all is on a less cumbersome and already used type of real-estate, instead of these desert Behemoths as the way to assemble enough surface area to collect a decent amount of power..
to be really Frank, the name issue is a very real problem. I have negative or just silly connotations with both definitions of the word Tripe. Even without those meanings, the ring of the word just sounds silly. Sorry. I'm sure your hard work deserves a better reading than it's getting with that title. Don't be too proud (and some of your later comments suggest to me that you might want to dig up a little more humility, while posting your request here is honorable, I have to say) .. sticking too hard to that one word could undermine many of the good ideas that are too far inside the paper for almost anyone to make it to. Don't make us giggle at the intro. As the woman said to the Butcher.. "You're offering me something that came from a Cow's Stomach? No thanks, I'll just take a couple dozen eggs.."
You never get a second chance to make a first impression. Do please consider changing the name. Best, and thanks for working to fight the problems that bring us all here. JoKuhl: The system could be called the TUES short for Transportation-Utility-Energy-System. Or it could be called the Track Pipe System. I think the kids would like the "Tripe", as a name. I feel the gifts that I have for generating ideas should be chalked up to the Glory of God, and I really think this is my best possible gift to humanity. I may have a few idiosyncrasies? I like your ideas about electrification, and would like to know more about those details. Thank you Thank you Thank you for taking the time to have a look at the new system. I don't know if you were lurking or already here when TOTONIELA was posting here, but your description was sounding an awful lot like his 'Spiderweb Riding'.. (Was that the name?) which was pipes that carried essentials, that doubled as a Rail System for Human Powered Vehicles.. Pedal Cars and Modded Bikes, etc.. He was always offering us up his Glories in some wild and wildly-termed ideas. I still felt that this particular doubling was troublesome, tho' I do like many types of hybridding, if you will, as mentioned above.. and I don't want to put off our wild and crazy idea-folk. I tend to be in that camp as well.. and as you said 300:1 is an ok ratio. You do seem to have your idiosyncracies. You can relish them, but do make sure you're listening to the feedback so you know what has gotten some traction as an idea, and what is not engaging others. You still get to decide whether it's the idea or just the language it came wrapped in that got in the way.. but keep aware of the audience. The Rail-R.O.W. ideas are pretty generic. I put down much of what I've been thinking on that score. I have been swayed by Alan Drake's discussions on Rail Elecrification, and have just been glomming other components onto that plan. My Tribute to TOTONIELA, wherever he may be, and however he spelled that darned name (Bob Shaw is his given name), is the variant on Spiderweb, which is to have those small Amusement Park Train Tracks built to carry a form of Velomobile that can switch from road to small-rail, and these would be the efficient speed routes to get between neighboring towns, or the 'Ring' around a city, etc..
Keep the ideas coming. But be conscientious in how you share them. Jokuhl: Very interesting post. I've never heard of the proposal, but I will google it up. I have never lurked a day in my life. I'm on Fishfolk, and that keeps me busy. I got on railroad.net, and was booted. I got on TOD about two months ago, and immediately started bothering people here on this fine list. And that's not a lot of tripe. Problems and their causes are the home of the light weights. It is in the solutions to the problems where the heavy weights live. The true heavy weights are those who are able to recognize the difference between problems with solutions and dilemmas which require profound paradigm shifts in world views. My suspicion is that you are not one of them. FMagyar: I use a system of problem solving, that I call the 1-2-3-4. 1. What is the problem(s)? I tend not to dwell here, but it's very important to first frame the question. Even though it is important, it is just a part, but not the easy part of problem solving. Tail chasers live exclusively in the problem phase. 2. What is the cause(s) of the problem? This is important and leads to offshoots of solutions. But lots of research into various causes of the problem may not lead to the good viable answers we need. 3. List the possible solutions to the problem. This is where I live. I'm an idea man. I generate many possible solutions. My suspicion, or hope, is that of my solutions: One in thirty may be somewhat clever or could at least be considered, One in three hundred ideas for me will produce one good sound idea, for sure. I am of the hope that I get a grand slam of an idea, such as I think the tripe system is, a paradigm shift of profound importance to humanity. But the work is in the 3. the list of possible solutions, that's where I usually dwell. The 4. is What is the best possible solution? This is the easy part paradoxically. So if we're talking about energy systems, the machine design, the complex system of choice, that is the nut to crack. I hope the tripe system is as good as I think it is, after all the hundreds of pages of ideas, or project ideas, or detail sketches. I solved the energy crisis. See the Tripe System Report www.environmentalfisherman.com World views be damned! (Glory be to the proper system gift, because that's what good ideas are... gifts.) My dad gave me the above method, which is in Dale Carnagie's book, "How to stop worrying and start living". FMagyar: Do you think it is possible someone will "solve the energy crisis?" Do you think it can be done? Since you just made it clear that you have already solved it, I'm not going to worry about it and will just go on with my life. I read both your Tripe System Report and your Market Quota system, while they contain some ideas and concepts to which I my self am sympathetic I got the impression that it is mostly an exercise in cornucopian pipe dreaming (no pun intended) with very little substance to back it up. I wish you well in your attempts to implement your ideas and finally convince the world that we have nothing to worry about because you Steven, have solved the world's energy crisis. Let us know when you start working on a plan to control population growth and you get the Tea Party to sign on to it... World views be damned, indeed! Hey, Thanks FMagyar: I am sorry to offend with the world view slam. Perhaps I am ignorant there. Probably I feel it's hard to work on complex systems and devote lots of time and energy to world consensus, which is often old thinking in transition, to me it's just tiring. I would like to have more time for it. And. Yes. I am arrogant. It helps my thinking. Sorry. Thanks very much for having a look at the new yet to be cordially named system. Providing a common denominator system that new green systems can plug into, and as well the old systems too. That's close enough for me. Once we have that then we can turn to and make it happen, hopefully to reverse climate change. I don't do the tea party thing. I'm a Republican, constantly in a state of political disgust. I think I'm mostly a bit right of center. I do have some work to do on the population issue, which is paramount. It entails a market system of sorts, incentives and penalties. Never underestimate the power of the shouting optimist to rankle folks, but I do feel again this will be solved maybe by you or I. That's the seed I water, hope. (rooted in inane pipe dreaming) For the record: I AM worried as hell about our problems. I sincerely thank you from the bottom of my heart for taking the time. Yes, and perhaps it's a leading question/lense that elicits a certain kind of response. What if, instead, the site was called The (Peak) Stupidity Drum? Isn't oil/coal supposed to be more portable though? Also, do you think that existing production is going to be supplanted soon enough, such as where India or China for example are concerned? This KiteGen thing seems like more for its own sake than anything down-to-earth/tried-and-true for people's/earth's sakes. And we have those already. Some of them are called trees. Nature's high tech. All of that time, money and effort for KiteGen, etc., could be put toward planting more of them, and maybe helping to supplant centralized corporatocratic structures that support some of these very projects like KG. You've got your themes, but you're wielding them strangely. How does this group of a few folks making energy-collecting kites work against any number of other people reforesting or supporting ecologies? If they were talking about biomass or woodstoves, maybe I'd see a correlation.. but this is a generating tech that doesn't salt the forests with ANY precipitates from burning fuels. How do you know what kind of Corporate Support they are built on? What kind of corporate support is your Laptop built on, and should we eviscerate it before we've let blogging and other internet comms serve to connect us during these uncertain times? Oil and coal portable.. so? We're back to Peak FF then, or simply the foolishness of burning stuff with the atmosphere and climate in the balance. Use electric rail and similar wired systems, and your electric transport is portable and doesn't have to carry energy storage at all. Soon Enough.. who knows? Let's keep stalling them and call them failures when there are hardly ANY substitutes in place. Well, for one, you wrote 'supplant', but KG doesn't seem to do that given its apparent lack of the (high energy) portability of oil. What of infrastructure and maintenance of this system? Materials? Transport? Control/Grid-dependence? Environment? Energy/technology-independence? Why do fossils even need to be (entirely) supplanted? How are we using the energy we already have now? Responsibly? What about the carrying capacity of the earth? If all the fossil fuels were somehow supplanted, what would happen to the population if, as some suggest, its size is correlated with energy? Would it keep growing? How big is too big? What about the oceans and over-fishing? What would we use the supplanted energy for? Desalinization? Why? Unintended consequences with that? Birds? How many dams and other forms of power generation do we have? Again, when is enough enough? How do you know what kind of Corporate Support they are built on? I think I wrote 'like', but in any case, what is its place in that scheme? What's the scheme? No response there at that post either last I looked. What kind of corporate support is your Laptop built on, and should we eviscerate it before we've let blogging and other internet comms serve to connect us during these uncertain times? Tech advancements come with all sorts of issues and with all sorts of historical circumstances which don't necessarily have anything to do with true advancement. And often, when you boil them down so to speak, they don't offer much, and in fact can take away from the true quality of life. We could easily have been having this conversation face-to-face, say in our village's roundhouse, rather than on our corporate computers. Should we be on Mars by now? Why? "The emerging reality is this - I would argue that women are in some ways more free, and in many ways more constrained by this model, but most constrained by the fact that we mostly accept uncritically that we are better off having abandoned the household economy for the formal one, and constrained by the fact that we have tied our interests to institutions that most of us recognise do not have our interests at heart. And that's precisely the argument I make about technical feasibility - in many ways, our number running on what is technically possible to 'save' society blinds us to the fact that this focus on outer range possibilities for which the underlying conditions are not evident actually forces us into new kinds of constraint - as long as our eyes are fixated purely on the numbers, we do not see the world in which we really and fully live. As long as we are fixated on the dollars, we do not see the possibilities that really are available to us." Looks like two words to me. Which plays nicely into my point; that peak oil has us by the balls with our own stupidity. And due to the inner modularity of the technology, that foresees the multiplication of single steering units producing energy on a larger circular path, the scalability of the Kite Gen power plants comes without significant structural and cost constraints. In a way, the difficulty in growing the size of a plant can be compared to what it takes, having built an automobile, to build a long line of the same automobiles. ...In this sense, the energy systems touted as saviors of modern society, glorified and worshipped through ad campaigns full of calming, green vistas, have more in common with coal power plants of the past than any energy independence utopia of the future. They continue the tradition of monolithic energy systems, bringing with them the attendant social and political characteristics, the political economy of the energy of the past. Langdon Winner refers to the social and political dimensions associated with a given physical energy technology as an energy regime. The energy regime of the past, and the one large-scale renewables stand to replicate, is characterized by 'extremely large, complex, centralized, and hierarchically managed' systems reliant on, and constantly reinforcing, a social contract that is predicated upon a highly developed technocrat class, the political will to support them and the positioning of 'energy users' as 'energy consumers,' purchasing from an amorphous energy system, 'black boxes - input/output devices whose internal structure is of no particular public concern.' (Winner 1982: 273;272). Here emerges a crucial point of action for the radical, anti-authoritarian left. The development of new energy systems that mimic the energy regime of the past stand to repeat and strengthen the authoritarian, capitalist social forms of the past, quite literally cementing them in steel and iron, plastic and glass." Is this an attempt to keep industrial civilization going and, if not, what is the aim? Has an environmental impact assessment been done? You said it correctly, I think. The kitegen is an attempt to keep industrial civilization going. This civilization started with an EROEI of about 100 and we can't keep it going without something comparable. Probably, it is impossible with traditional silicon PV (EROEI around 10) (but CdTe may have a chance) and with traditional wind towers (EROEI arond 20-30)- The kitegen could have the right kind of EROEI and - at the same time - the flexibility required to replace traditional sources. At the same time, even if the kitegen turns out to have an EROEI=100, it won't be enough. If you look at the calculations made by the "LImits to Growth" team, even abundant and low cost energy is not enough to avoid collapse. It is useless to have energy if we don't recycle materials and we don't limit population. On the other hand, the kind of civilization you have adapts to the EROEI it is based on. So, in any case we'll have some kind of civilization. If we, as a society, go from 1000:1 EROEI to 100:1, it makes no difference at all. It means that the energy input cost of providing energy has gone from .1% of the output value of the energy to 1%. That's nothing. For gasoline, for instance, it would mean an increase in cost from $2 to $2.018. Going from 100:1 to 10:1 is larger, but not very important: energy input costs rise from 1% to 10%, and we start to deplete resources a little faster, but not that much (to be precise, 9% faster). For society as a whole, perhaps the energy sector goes from 10% of the economy to 11%. A bit of a hit (that's a one-time, effective drop in income of 1%), but in the long run not important. Put another way, a drop in E0ROI from 40:1 to 20:1 only decreases the net energy surplus from 97.5% to 95%, for a decrease of 2.5% -hardly significant. which showed that wind's E-ROI was around 19. If you study his sources, you'll see that that most of the studies are quite old. If you look at the turbines used in those studies, you'll see that the turbines studied were much smaller than those in use today - look at Figure 2, and read the discussion. If you study that chart, you'll see a very clear correlation between turbine size and E-ROI. It's perfectly clear that Vesta's claim for a current E-ROI of around 50 is perfectly credible. Again, an E-ROI of 19 is more than enough. There isn't an important difference between an E-ROI of 20 and an E-ROI of 50. It's like miles per gallon: we're confused by the fact that we're dividing output into input, when we should be doing the reverse, and thinking in terms of net energy. An E-ROI of 20 means a net energy of 95%, while an E-ROI of 50 means a net energy of 98%: there really isn't a significant difference. Ahhh but Nick - you are creating a 1:1 relationship with money and energy then discussing the difference as if economic activity has no load factors. And as if a 1:1 relationship exists. Economic activity has plenty of load factors. Taxes. Bankers. Look at the EU report about 'green' projects. For every unit spent on the actual carbon reduction, a unit is handed over to the investment bankers. I was primarily discussing E-ROI. I did suggest that a similar relationship exist for money. We can separate that, if you like - I'm not sure it makes a difference. Sure. For these things, cost may be a better measure than E-ROI. By that measure wind, and even solar and nuclear, will do just fine. I have to agree with Eric.. I think you're over-extrapolating with these very spongy EROEI estimates.. It's the Impala not outrunning the lion, but just another Impala again.. only in this case it's essentially the reverse. Wind at (? )19 or Kitegen at 100 or whatever it turns out to be.. they aren't alone in the field competing Gazelle to Gazelle.. they are both competing against Coal, NG, Oil, Ethanol, Uranium.. whatever else. In which case, it's a competition about many other particulars, such as Location^3, availability of Essential Materials or Trained Workforce, Permitting and Political support, the quirks of the Weather..
As far as I can tell, research on E-ROI pretty much stopped for both wind and solar when the researchers concluded that E-ROI was "high enough". The field just stopped being interesting for those who were publishing. E-ROI has continued to rise sharply in the last 10 years, but all we have are these old estimates. It's the Impala not outrunning the lion, but just another Impala again.. I know what you mean, but Ugo was talking not about competitiveness, but viability. IOW, he was suggesting that energy sources with an E-ROI of 20, whatever they were, couldn't support a prosperous society. I agree: diversity is good. The kitegen is an attempt to keep industrial civilization going. "Modern industrial civilization has developed within a certain system of convenient myths. The driving force of modern industrial civilization has been individual material gain, which is accepted as legitimate, even praiseworthy, on the grounds that private vices yield public benefits, in the classic formulation. Now, it has long been understood, very well, that a society that is based on this principle will destroy itself in time. It can only persist, with whatever suffering and injustice that it entails, as long as it is possible to pretend that the destructive forces that humans create are limited, that the world is an infinite resource, and that the world is an infinite garbage can. At this stage of history either one of two things is possible. Either the general population will take control of its own destiny and will concern itself with community interests, guided by values of solidarity, sympathy and concern for others, or alternatively there will be no destiny for anyone to control...In this possibly terminal phase of human existence, democracy and freedom are more than values to be treasured, they may well be essential to survival." How does the Kite get airborne in the first place? I'm guessing the twin fans have something to do with it but they won't be able to blow the Kite and cabling to high enough altitude unless there is a steady regular breeze at low altitude at the time of launch. Yes, there is undoubtedly a good consistent wind at elevated altitude but this will still be dependent upon 'regular' low altitude winds such as power wind turbines. Nice idea in principle, hope it works but not convinced that it could be better than regular turbines until someone addresses the sticky issue of launch. Getting the kite airborne is one of the things that will need experimenting. Fans may not be needed; they are shown in the pictures as a possible solution. Launching the kite may be obtained just by the centrifugal action of a rapid turn of the "arm". I've played with my flexifoil kites for almost 20 years - they are stackable and can achieve an awesome amount of pull - great for dragging 3 people across fields and anything else that happens to be in the way, so I'm well familiar with the power cone! Flexifoils don't crash well because of the carbon fibre spar - they land upside down and are impossible to relaunch without manually flipping and lifting back into the wind. Kitesurfing kites have inflatable leading edges, and can relaunch on water, but they are like bats wings and don't have the crucial aerofoil cross-section as far as I can tell. However, I do have some other ideas for relaunch capabilities. The first difficulty I think about would be launch and recovery of the kites. An unsuccessful launch or recovery might damage or destroy the kite and/or the tether, so this must be made into an infrequent event. Of course amateurs flying their own kites nearby could become entangled, perhaps as an act of sabatoge. But, I'm sure you've discussed these issues. Id just like to hear something about the solutions. With glass on their strings in an attempt to cut the other kite loose? Look, you have things like 2 RC airplanes/heliocoptors which could deliver a simple thermite charge to burn the oil-based tether. Or lasers in the UV spectrum which can age the cable/cut the cable with enought power. Or a simple explosive. (how about a tractor-trailer semi driven into a base at high speed?) Which then gets a failure mode of? The kite comes free and eventually falls to the surface of the Earth. Yes, that point of Earth contact could be damaging. But its not like the demonstrated failure mode of Fission power that leaves the area unuseable. Or mining that has historically left things with elevated heavy metals. Or even the 4-20 unpleasantness brought to the globe via BP. Its failure mode is less predictable than a normal wind turbine but I'm guessing manageable. But, alas, we won't know their failure mode costs until there are a few failures. Don't necessarily need glass on the strings, the friction of one line running over another at the same spot will burn through it in fractions of a second. BTDT! Failure mode is pretty tame in comparison to other technologies that could go wrong badly. If one string breaks, the kite loses traction, spins in circles and could be winched in while sinking (would still need a capstan to not crush the winch drum). Losing both lines would be very rare, but I doubt a few 100sqms of fabric would cause much damage unless it snagged on a building or a tree in a gale and brought them down. Could be a theoretical risk of decapitating an unlucky motorcyclist. A replacement kite from inventory could be up and running within the hour. Unpack, attach and go. Ugo, thanks again for the report on kitegen, one of my favorites. And you are to be congratulated for emphasizing how much robots and computing power can change things. My favorite day dream there is the final realization by airlines that airline crews are far more likely to kill people with some sort of stupid reflex action in a tough situation than a calm, cool, smart robot would. And I'll bet the robot would be cheaper to feed, and, with the right clothes, look equally cute to the ladies. Similarly, in my own playground, solar thermal machines, I look forward to a mini power tower surrounded by very smart heliostats that have essentially perfect aim- at any of several towers as the sun moves around the earth. -----It's amazing how many people (see comments on your kite above) think engineers are really, really stupid. Like, maybe, they think the sun moves around the earth. I once heard, years ago, that in the future, with the rapid development of autopilot technology, airplanes would need a flight crew of just one pilot, and a dog. The pilot, so that the passengers would feel good knowing there is one, and the dog, to bite the pilot if he tries to touch anything! I'll add that a car in exchange for a polluted river (and all that comes with it) isn't progress. As far as a heliostat is concerned, the sun *does* go around the Earth! This project deserves a high score for innovation!! I do, however, like many others in this thread, have some comments. In Alfatroll AS (www.alfatroll.com) we make knowledge based systems for unmanned aircaft, all it takes with the autopilot and all - as well as its capability to avoid other traffic and following the ICAO Annex 2, "The rules of the air". The latter we call a "cognitive pilot", since it will react upon incidents that are popping up from "out of the blue", using a patented knowledge based system. We are also active in http://www.uvs-international.org/, and participate in Unmanned related conferences and regulatory work in Europe (mostly). The European Commission driven effort to create a "Single European Sky" opens up for automatic air traffic control (ATC), but that is at least a decade or two away. It is clear to me that such a system has a technical side (which you no doubt will solve), but also a regulatory side. The Eurocontrol (and the FAA) will regard these kites as "aircraft", and demand that they follow the rules of the air. If that is to be avoided, they will demand them to be operated in a separate, restricted airspace, open to nobody else. I have doubts that they will allow areas that cover varying altitudes from the ground and up to, say, 2000. Key: Even any model plane operated professionally need to comply with these regulations in mind, according to the rules being drawn by the Eurocontrol. A kite attached to the ground resembles the balloons used during WWII to block incoming bombers (airspace wise, not the technology), and may pose significant problems for other air traffic, especially at 2000m - where the termals are strong. Are you adressing this aspect at all? Maybe we, after Peak Oil, will have less traffic in the airspace, but until then I guess this must be addressed. As for the technical side, after 45 years of flying gliders I am well familiar with the wind systems you are exploiting (even in Italy). Hang (ridge uplift driven) wind is one thing, while solar driven thermals are another. The latter only occur during certain hours during the day, and may vary in bursts and move around. We have discussed for decades how this energy can be captured, and maybe your solution is it. There also is an Australian solution, where they intend to create thermals in a ground based "funnel" - and capture energy there. Will look it up some time if it is of interest. Maybe I am just adding vinegar in your soup, but dont let the critics stop the experimental effort. As you know, we need all the solutions for renewable energy we can get. This is also a method to capture thermal/solar energy. Much simpler, no hi-tech. Ahh yes, this Solar tower idea seems to have rather stalled. a civil-engineering problem, not an energy generation one. That is why it has not really progressed beyond pilot stages, in decades. It's simply Cheaper to invest the Civil Engineering costs, into more turbines, and build a conventional wind farm, and the solar area costs, into a conventional CSP plant. I do not expect this idea to ever be widely deployed. Very interesting comments, Tor. The kites of the kitegen system are, indeed, UAVs (or drones). The difference is that kites are tethered, while military UAVs are not - but kites are aircraft at all effects and - correctly, must obey the rules of the air. Indeed, the kites can only be flown with a permit from the appropriate authorities. Having that permit means that a "hemisphere" of about 2 km radius must be reserved for the kites. There are already "no-fly" zones over strategically sensitive sites, for instance nuclear plants. With patience and a lot of work, it is possible to obtain such a permit. I saw your site; very interesting, too. UAV controlling devices are continuously evolving and becoming more sophisticated. I have no way to know how the kitegen system compares to military ones; say, those of the Predator. I am sure that the military use very sophisticated control systems. I'd bet that the Kitegen doesn't fare so badly in comparison but, after all, kites don't need to fight anything, so the flight control system just needs to be good enough. The promise of the kitegen is remarkable; preliminary calculations indicate an EROEI better than anything that can be obtained by traditional wind or solar technologies. However, one thing is paper, another is the reality of putting together a machine that had never been built before. Making claims about EROEI before an operational system is built, it perhaps foolish. The idea certainly has merit, but capacity factor is likely to be low. The fundamentals suggest highly cyclic power, and widely varying loads. * Appx 23% of the time, negative power is needed, peaking at nearly 3x the average. A refined system would probably want to lower that peak. as 'double capacity' peaks will be the design parameter. and deliver a practical grid power source. ~25% positive time, suggests multiples of 4.
rewind peaks - perhaps a flywheel would be sufficient ? Some of the notes suggest 12 kites on a 800m land base, which would need real care to prevent tangling the lines. Blown kites will be a frequent issue, and it would be an operational cost. Given good enough forecasting, such a site could work like any yacht (or kite surfer), with sets of sails, for wind speed ranges. That would add a labour cost, but give a wide wind range tolerance. All up, I'd call claims of an EROEI better than anything that can be obtained by traditional wind or solar technologies rather superficial and optimistic. - but I would encourage them to build a real system, and clock up the vital operating hours, to see the actual delivered up-times. Some serious peak:average power issues exist here, along with some spectacular failure modes. They would make a great tourist attraction. Compare this kite generator to large industrial motors but with inverse power. The large industrial motors are required to have a slow ramp-up ramp-down time aka softstarter. The powerproduction from a single kite can surely be made to look similar to the usage of a large industrial motor. If grid-tied industrial motors are not a problem, then a similar sized kite-generator cannot be a problem too. So in different factories (or even within the same factory) multiple large motors can start/stop at non-synchronized intervals, and there should not be a need for kite-generators to be installed in multiples of 2 or 4 or whatever. Just distribute them over the grid should be enough. You are correct only to a point. This thinking is well suited to hobby sized systems, where you just use the grid as a battery. Easy peasy. However, if you are serious about supplying real power to a utility, they certainly will care about the quality profile of that power. Someone has to pay for the power smoothing. If you look carefully at the power profiles in the link I gave, you can see a number of power smoothing issues. The Looping path gives significant repeating short duration (single digit seconds) peaks, and this ripple can exceed half the average power. Next, the retrieve path not only falls, but goes briefly, and strongly, negative. A utility customer is not going to tolerate that, as you are asking someone else to have ready high peak capacity but low average supply. In any serious offering, the cyclic variations are certainly going to need to be solved 'on site', and they should be addressing these as part of the design. The Ampyx Power link given above, look to have identical power basis, but a 'smarter aerofoil', which should reduce the negative power profile issues (but still have voids that need filling). A simple void-fill, on a 1:6 cycle, is 6(+) units, carefully phased. It should be easy to shape-shift void fills, to cope with (eg) 5,6,7,8 phased generators and that allows Maintenance time on any 1-2 units, without any nasty effects on the output profile. Don't be silly. The short-term fluctuations (on the order of seconds) are relatively easily buffered at the generating site and I expect that they have taken them into consideration in the design. We've taken this idea to pieces before, and I for one am confident that they have taken all the obvious potential problems into account. Your post self contradicts - first you say 'don't be silly', but then you make my precise point, that fluctuations will need to be locally buffered/handled ?!. We await a fully working system, which will need to be more than one kite. They're in development. They're 'awaiting a fully working system' as well.. but they are actually hard at work taking the required steps to get there, while some like you peck away at obvious questions as if they are astonishing oversights. They put up a small kite. Now they're putting up their first big one.. then, they'll likely put up a second one with it and work on the rudimentary refinements of group control. At that point, are you going to say 'You won't know until there are at least a dozen up there..' You'd be right, but not saying anything they didn't already know. I actually had your points in mind when writing my original post. A single 1 MW kite will have a 1.1 or 1.2 MW cycle, yes, that's why I said it's comparable to big industrial motors. 1 MW isn't that much really. But when you scale it up to utility size (e.g. a single NG plant will produce 300 MW) which will need 300 kites for it's replacement, you now can use the 300 kites to match demand and smooth out the single cycle variances by having kites reel in and out in different stages of the cycle at the same time. You can even have spinning reserve by having kites producing less than maximum power or having them 'parked' in the air ready to pull the winch out when power is needed, although up to utility power scale you probably want to maximise power output over grid balance duties. I think grid-balancing this is just a non-issue, especially if readiness cost is much cheaper then standby price of a nat-gas plant, in that situation kites would take over the grid quality control job too. Energy could also be extracted on the kite's instroke. Use a large spring, heavy weight (pulleys to reduce height), air reservoir, water reservoir, flywheel etc to store excess energy on the outstroke which can be reclaimed on the instroke. Simplest picture would be a weight lifting up and down charging a flywheel in constant direction on both strokes, with the generator taking 50% on the way out, and the other 50% on the way back. Would require a bit of balancing to keep things within limits. In the sense of 'can it be done', yes it is not a big issue; but energy smoothing does need to be added to the total budgets, and included in the efficiency claims. The plant does need to produce high quality grid power. When the multiple kites are all correctly phased, the demand on spinning storage will fall, and it can be used for downstream load soaking, or idled, as needed. Sure, grid balancing is always needed. Not just with kites but also with coal, conventional wind, nuclear and even very high efficiency gas plants. The balancing cost is usually fairly low, even with intermittent conventional wind as has been discussed a few times before here on TOD. OTH I don't see the balancing costs mentioned when people refer to coal or nuclear efficiencies, it is just a separate issue not necessarily specific to kite windpower. Having an inverter allows kitegen to produce exactly the power that is needed to improve the grid. Controlling voltage, frequency, phase and other parameters with power electronics is very easy and quickly achieved. Much easier then to use the throttle on a turbine plant with all it's positive and negative feedback loops and synchronous generator for instance. This really reads like something in the back of a magazine, right there with "flying cars" and "run your car on water"
1. How does the Kite get launched? 2. How do the Kites avoid entanglement? I don't see how it could be difficult. Anyone who's flown a two-handled kite can understand that the kite is absolutely controllable. Left, right, up, down, whirl, twirl, higher, lower, etc. The Kitegen I imagine is a far heavier kite that will not swerve suddenly so much so that a machine controlling the ropes will be unable to adjust. Similar to ABS, the system is able to modulate the brakes far faster and purposefully than a human driver. Rather than thinking in terms of tens of seconds, the computers are making adjustments in thousandths of one second. I can't imagine outside of total computer failure that entanglement will be an issue. I hope the Kitegen is a tremendous success, and it sounds like it will be. I'm really sort of disappointed in the clowns casting doubt on this device. My comment reflects the rules of the air. This device flies in the air. All airborne traffic is subject to strict rules and regulations. Do you say that pointing this out make me a clown? What about my 45 years of experience utilizing the forces Ugo wants to exploit, om my part as a glider pilot? Or did you not include my comment in your broad assessment of the critics? I prefer the "clowns" direction. Speaking of which, I learned about this man this weekend. In the article, it says that children mistake him for a wizard, and it inspired me to ponder along the lines of all wise older people as being wizards in a sense... and that perhaps our culture, through its diminishing of many values, has lost much of its wisdom, its wizardry. I am not referring to legitimate criticism - I'm referring to those criticisms that dismiss this device out-of-hand with weird questions that at this stage are long past being issues. I think that any reasonable attempt to generate energy, especially one that's going to see the light of day should be encouraged. I do agree that the cylinder of space around these kites will be a major consideration to deployment - yet - I think that this device has more promise than people are giving it credit for. I'm sorry if I offended you in any way. The construction of a full-size prototype is great news! I wish it every success. Most of the negative comments above appear to be due to a lack of knowledge about KiteGen. There is quite a lot of detailed information available and it is clear from reading it that the people involved with KiteGen are clever and know what they are doing. KiteGen is a simple concept but one that needs a great deal of human intelligence and applied mathematics to maximise the amount of power produced. Part I (chapters 1-7) is essential reading in my opinion. What is interesting is that the paper suggests that a KG-carousel (with kite-steering units running on a circular railway track) might not produce as much power as a KG-yoyo configuration. This is different from earlier literature. The paper also states that a wind farm with KG-yoyo units spaced every 250m on a square grid could produce six to ten times the power of conventional wind turbines in the same area. my congratulation for the deep attention on the topic, finally we facing the important aspects. and the Carousel was considered a level of complexity unreachable and unuseful for the basic work and comprehension needed. The KiteGen servo-electromechanic choices and design was one of the aspects more discussed and deeply analysed with the students. The model of the KiteGen Carousel adopted by Fagiano is a free (and uncorrect) reinterpretation of the still undisclosed model, set-up and adopted by KiteGen, It was done without or after the KiteGen support, I'm even favourably surprised for the clever tentative. Im waiting for new Phd students, hopefully updated and ready to learn through the previous works and the status of the art, in order to easily perform the step forward and disclose and publish the Carousel details and opportunities. The KiteGen Carousel concept develops a curious attitude of researchers, they think to have reached in autonomy the full understanding applying only a two-dimensional operational schema totally missing the third dimension available to the flying kites, that make a dramatic difference. Carousel convert the wind power with the prominence of the speed in the transfer equation, instead, in the yoyo schema the force is predominant, the result is that the Carousel modules are relatively thinner and lighter and this reflect immediately on ERoEI, even the ropes are relatively thinner allowing a sharp gains in aerodynamic efficiency, that play a quadratic role in the energy production capability. The official statement about the KiteGen Carousel is not changed, it is, at least, five times more efficient in ERoEI terms, than yoyo schema. The conservative ERoEI of the KiteGen Carousel obtained with LCA study based on the blueprints is around 1500, and the economic payback of the full developed 10GW machine is few months. Please, to all, before unleash critics about these figures, let me say that I would be really happy to accueil a panel enough skilled to revise the KiteGen work and achievements, up to now the several independent diligences of the whole KiteGen technology, produced mainly competitors, not too bad but unuseful to early spread the technology. For the competitors it isn't an easy job they are impeded by our patents to follow the most rational and feasible design, looking for improbable concept alternatives. I followed the worldwide technical contribution to the AWE concept and only Dave Lang of the Drachen Fundation made a remarcable step forward suitable for the yoyo schema, our intention is to try and possibly adopt his takeoff method. but I have to remember that Dave Lang was one of the few person able to early recognise and understand the KiteGen Carousel concept, an other was the autor of this post. Perhaps there is a way to finesse the patent problem so that you profit if they do, enough to make it worth your while but not so much as to deter them from trying? My understanding on patent licensing (in the US at least, the rules in Europe may be different) is that the terms are pretty well dictated by the patent holder. This means that terms can be expressed in say, MilliEuros per KWh sold? Patents are not good if they impede the benefit of an invention. In medical patents, patients die while the lawyers are arguing or competitors aren't contributing. By analogy, all present and future life on this planet is the patient. are intended to defend our right to proceed in the development, without that someboby could imped us to operate. The other are unwanted side effects. In any case we are not like Microsoft that has a rich budget to impose their own IPR. That is a paper of high technical level, and it is difficult to approach. However, in a personal note, I tried to simplify the terms to compare the carousel and the stem, and it results that the carousel is much more convenient in term of mass per unit power. 'qui' seems to be a live hyperlink but even when I click it I can't actually see the PDF file, so thank you for your simplified explanation. calcolato che il rapporto fra le velocità dell’aquilone e quella del vento è circa 2/3 l’efficienza. Pertanto a efficienza 10 questo rapporto è circa 6.66. The 5.2MB PDF file has almost 250 pages. Part I is about 120 pages long. The real world test data given in the PhD thesis from the small scale experiments are revealing. The first kite with an effective area of 5m2 produced a maximum power between 1 and 2 kw with the wind at ground level reported to be 4-5 m/s. A later experiment with a larger kite having an effective area of about 10 m2 produced a similar power output with reduced ground level wind speed of about 1-2 m/s and wind at altitude of about 3-4 m/s. Note that this is maximum power and the average will be less as the kite must be reeled in to begin the power cycle again. For a rough comparison, a small scale horizontal axis machine with a diameter of 4 m (13.1 feet) would produce about 2 kw at a speed of 9.8 m/s (22 mph). The swept area of that small turbine is 5.3 m2. At a speed of 4 m/s (9 mph) the turbine produces only a few hundred watts. Here are other small scale machines which can also provide a comparison. These data from the thesis are rather old, I suspect. I think it would be in Kitegen's interest to produce the latest test data for the small scale experiment which they ran. Revealing that information would give us a better idea of the performance of their system. Fascinating post, Ugo. I feel now more optimistic about the future of our civilisation than I have for a long time - though that's not saying much. What is the nameplate power output of the prototype? I have seen the figures 100 kW and 3 MW in the Kitegen publicity, but it's not clear what these refer to. A more general question about high altitude wind, which has been raised in response to an earlier post of yours, but not, as far as I can tell, been answered: how great a problem is the intermittency of generation? I would imagine it's a lot less than ground based devices, and the prospect of a much wider geographical spread of generators (i.e. in regions unsuitable for "traditional" wind turbines) should mitigate the problem further, but some sort of back-up will still be needed: any idea how much?